Let me tell you that this month would hold special place not personally but professionally as well. Yes, switching jobs might not be so easy that it sounds, though it comes with attractive packages. But adjusting to the environment and unlearning what you have learnt in your previous company post as a major challenge to you in your current assignment. But I adjusted well to this challenge and made friends. Coming to personal front, I am blogging in full swing. Previously odd sleeping hours and night shifts occupied my list and blog baby came last on the to do list. So you know the reason behind this cheerful post. So let's celebrate it with a sweet. Well this sweet is very special because this comes to me from Assam and the details of this Assam background will be shared in my upcoming posts. Edited to add: This is not a recipe tried by me. I got this recipe from my friend's mom in assam and I took the pics. 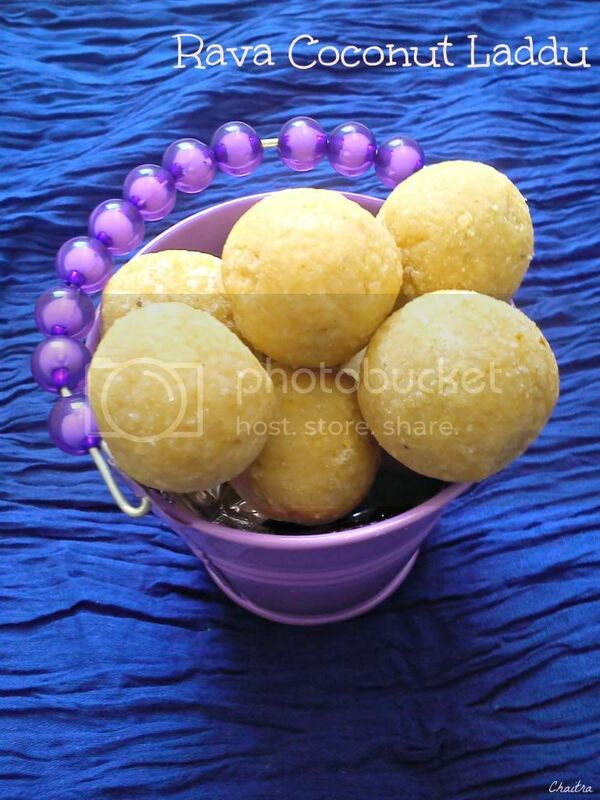 Though I was told that this laddu has rava, I couldn't find the texture of rava or taste. But will change it soon the moment I try it. Heat ghee and fry cashews until golden brown in color and raisins until plump. Remove & keep them aside. In the same pan, dry roast coconut without changing the color. It should take 1 min roughly. Remove from flame and keep it aside. To the same pan add rava and roast until nice aroma emanates. Add sugar and remaining ingredients except milk. Give a quick stir and keep your flame in low. Keep stirring continuously to avoid burning. After 2 mins. Switch off the flame. Once you are able to handle the mixture, add 2 tbsps of milk and see if you are able to shape this mixture into a ball. If you are unable to roll the mixture into a ball, add another tbsp and shape the mixture. Store it in air tight container. 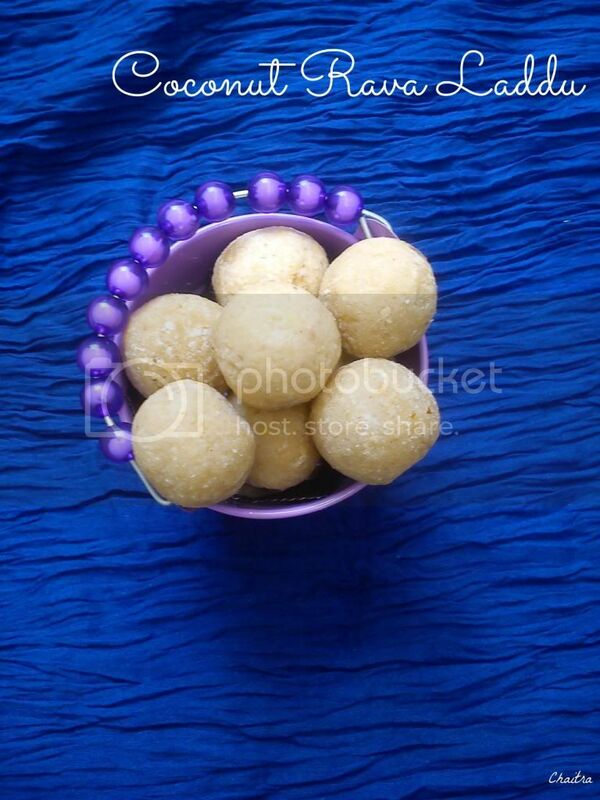 1) Usually the ratio is 1 cup rava and 1 cup sugar or 3/4th cup jaggery. We don't like too sweet laddus so kept the sugar level to decent. 2) Make sure that you do not add entire 1/4th cup milk at once. Add a spoon and check if you can roll it into ball, if not add another spoon and repeat. 3) After a day, refrigerate the laddus. Bring them to room temperature before you serve from fridge. Atleast 15 mins would be decent. Else you will have hard laddus. 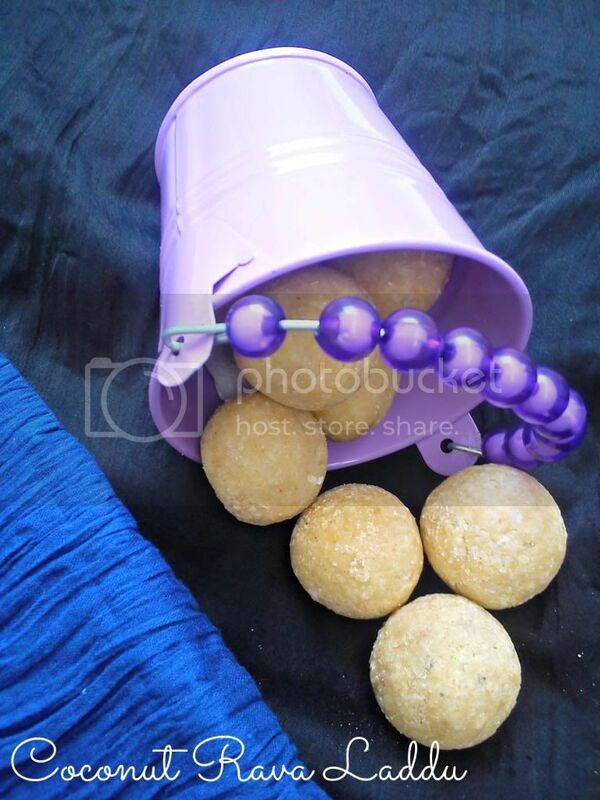 4) If you omit coconut, it is rava laddu. 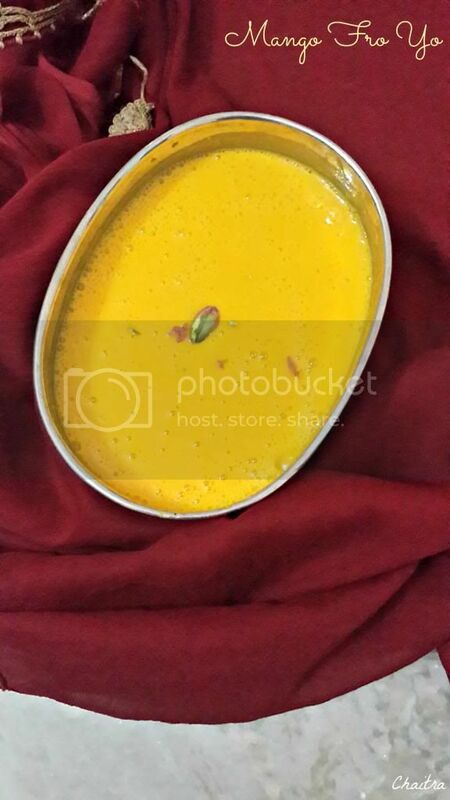 5) If you add 1 cup of milk to this mixture without removing it from heat, you will end up making nice goeey halwa. What was the taste of your season's first mango? Tada....Mine was pathetic and too sour. When I picked them from our local vendor, they looked ripe, plump and smelled great. When I had a piece, I realized that they were too sour and din't have much pulp. Well this experience continued for about first 20 days of May and I ended up having tasteless mangoes. So I let mangoes sit in fridge and forgot about it. Last night when I returned from office, I was totally drained and due to work pressure I skipped my dinner. I opened my fridge and was lucky enough to find some 2-3 mangoes and 3/4 th cup of yogurt. I put my blended into action and the resultant is below- Mango Froyo. Add mango pieces, yogurt, sugar, cardamom powder and sugar into a blender. Blend until smooth and creamy. Now add water and blend this mixture until frothy. Adjust sugar if required at this stage. Serve chilled and garnish with pistachios. 1)You can replace sugar with honey and play around with sugar/honey based on mangoes sweetness. Because we do not want too sweet juice right!! 2) Reduce yogurt to 1/2 cup and add 1/2 cup of water to get mango froyo of thinner consistency. 3) You can freeze this mixture in your freezer for about 5-6 hours and serve it as frozen dessert wherein the juice gets frozen. To get a creamy Frozen Yogurt you would need to blend the final mixture every 1 hour to prevent ice formation. This needs to be done 5 times and then allow the yogurt to set for 5-6 hours. Scoop the cream and serve. 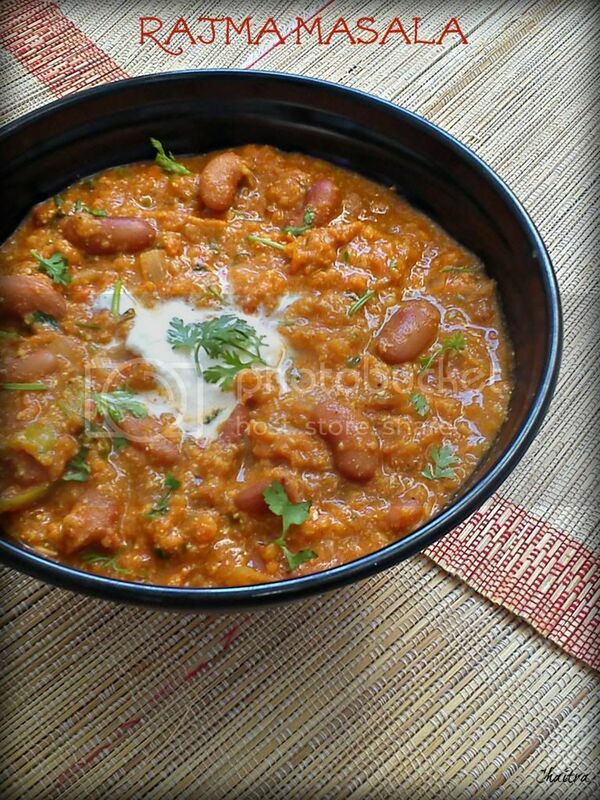 Soak rajma beans overnight and pressure cook until 2-3 whistles depending on your pressure cooker type. Make sure they do not get overcooked and turn mushy. Blend onions, cashews, tomato pieces, green chillies, garlic and ginger by adding 1/2 cup of water. Heat oil in a pan and add cinnamon stick and bay leaf. Fry until fragrant and then add this blended spice mixture. Fry for 6-7 mins or until pungent smells subside. Add all the spice mixtures and cook till oil is released from sides. Turn your flame to lowest possible and add milk. Keep stirring this mixture to avoid curdling of milk. 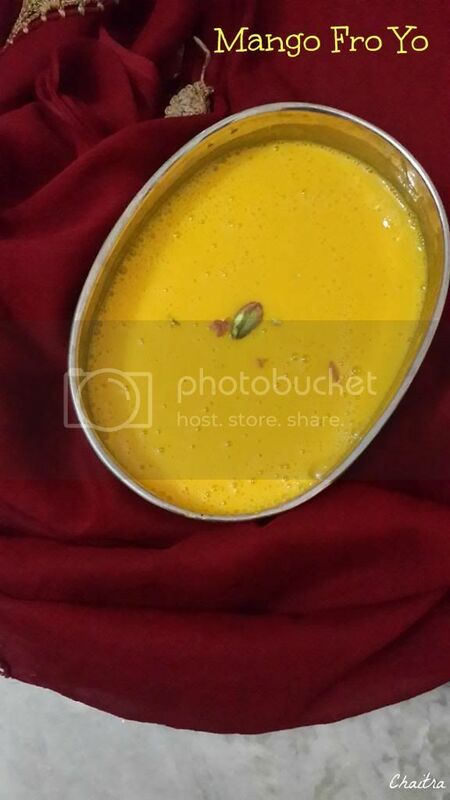 Incorporate milk and masala mixture well and allow this mixture to blend well. It takes about 3-4 mins. Now add pinto beans and give this mixture a stir. Add water if required and think that gravy is too thick. Just a 1/2 cup would do. Ensure all the ingredients are combined well and adjust salt if required. Add chopped cilantro and that's it you are done. 1) This is not that normal tomato puree gravy so do not expect it to be tangy. 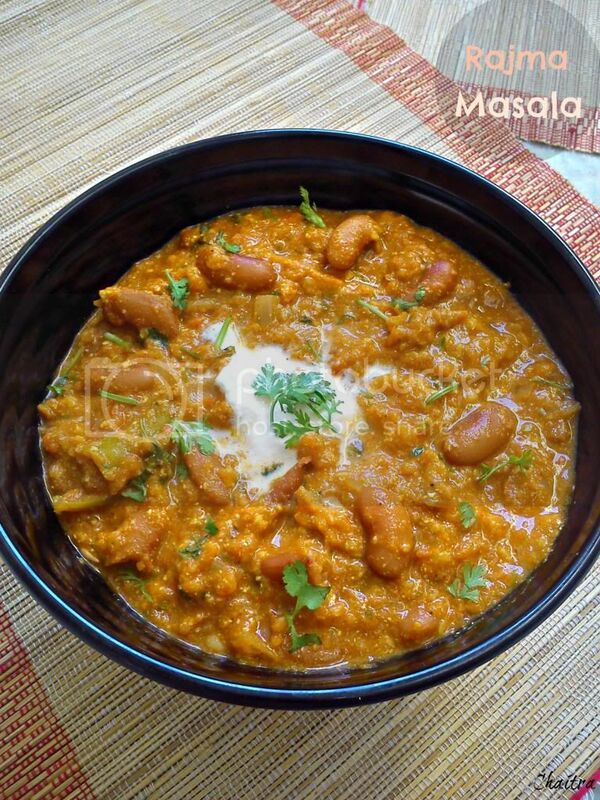 Its a mild and flavorful gravy and tastes just awesome. I personally feel this is my best gravy based recipe so far. 2) If you want the gravy to be tangy then add 4 tomatoes and 1 onion. You can even use instant tomato puree. 3) Instead of milk you can even use curd. 4) Use fresh ginger and garlic instead of paste for that pungent flavorful taste. I used to use ginger garlic paste and couldn't differentiate the taste like I did for this recipe. Spice powders come in as blessings when you are in no mood to cook or do not have any vegetables. They taste heavenly with steaming hot rice and a dollop of ghee. One such keeper is this recipe. I am not a big fan of coconut and at home my mom keeps usage of coconut in her dishes to minimal. Be it my disliking or its minimal usage, coconut based recipes couldn't make much way into my taste buds. 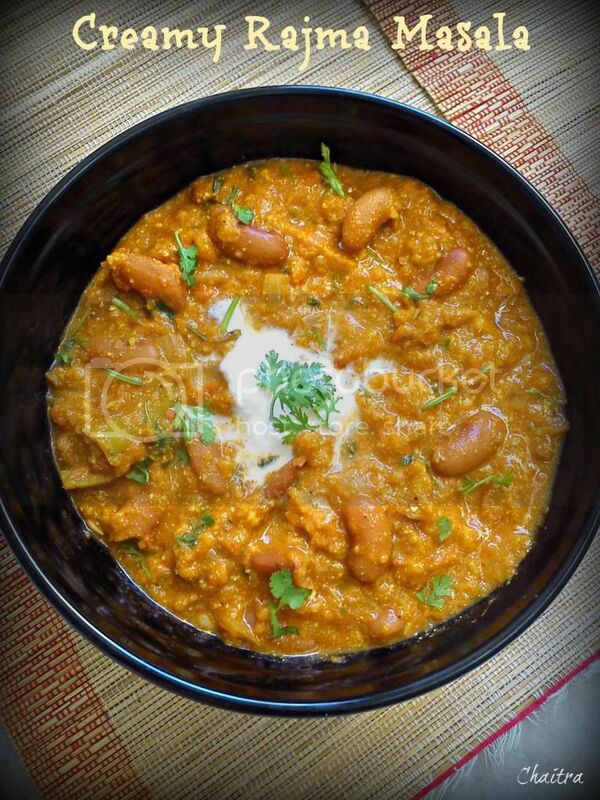 Our neighbor Bindu Aunty shares many traditional recipes in her kitty as she hails from a village. I can't stop appreciating her spice powders, pickles and biryanis. She can make biryani out of anything ...). So one day, she gave my mom this coconut powder and my mom din't bother to let us know because of me and my sis's disliking. My sis picked it up from the kitchen and placed it on our dining table. So on a boring day (boring day is when you do not have anything that interests you on your lunch menu) and when we din't feel like eating, my sis mixed it with a dollop of ghee . She found it heavenly and suggested me to try. 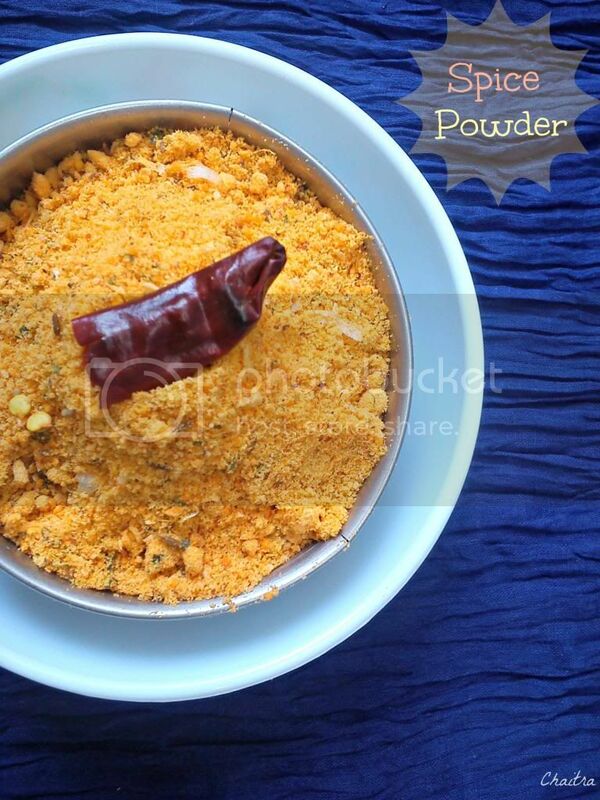 I did.... and I am in love with this spice powder and this makes way onto my idly plate, dosa plate and my rice as well. So try this out if you are not a big coconut lover like me... I am sure you will love it. Dry roast dry red chillies and curry leaves until they are crisp. Make sure that dry red chillies do not change their color. Allow it to cool. Now grind all the ingredients into a coarse powder. Adjust salt if required. Store in an air tight jar. You can opt out roasted gram. But I would recommend it as it gives nice texture to your spice powder. You can even dry roast garlic pods for about 30-40 secs and it gives nice flavor to the spice powder. I will surely try this and let you know. 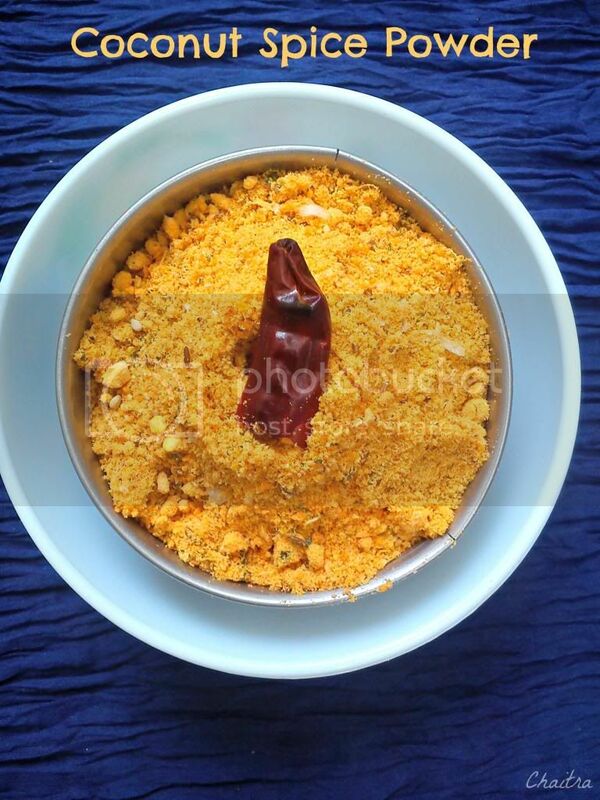 Instead of dry red chillies, red chilly powder can be used. Use 1-2 tsps and increase if you can manage the heat. Did I happen to crib much about summers and cooking in my last post?? I am sure I would have.....and so is the blogging world which is on a mission to tackle this harsh summer with easy recipes and refreshing drinks. Deciding on a lunch menu is very difficult for me because I am not that dal-rice person who can eat plain rice with dal and curry everyday. I love varieties or light meals. But Mr.P is completely opposite.He can lead his entire life with dal and rice. He has an interesting dal requirement....which he calls as Patla Patla (which is dal of thin consistency not even runny). So everytime I have to make sure that I add extra water and make thinny dal. So on a day, when I was in no mood to cook and when Mr.P wanted something homemade with rice. I had to rely on a book where I scribbled all one pot meals. 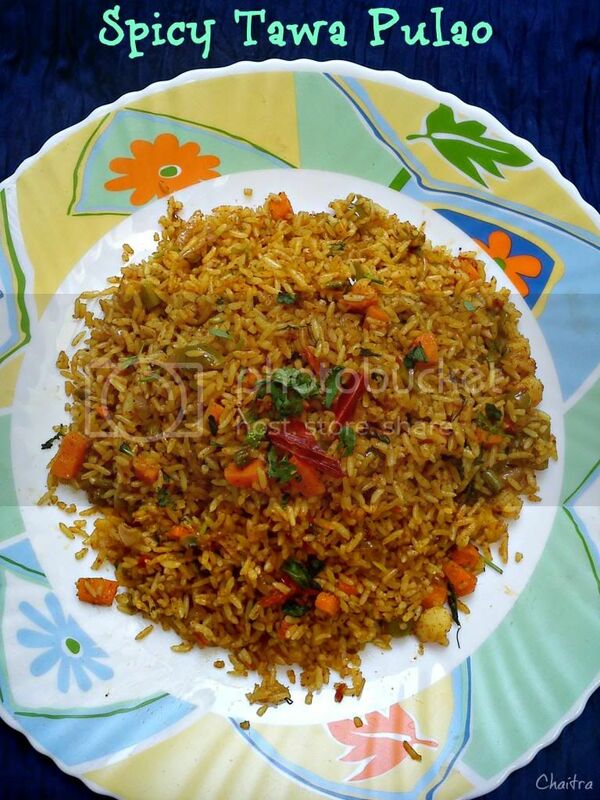 This tawa pulao caught my attention against paneer pulao, peas pulao, corn pulao etc n etc. Tawa Pulao is a street delicacy all the way from Mumbai and it is made on the same tawa where Pav Bhaji is made using Pav Bhaji Masala and minimal ingredients. 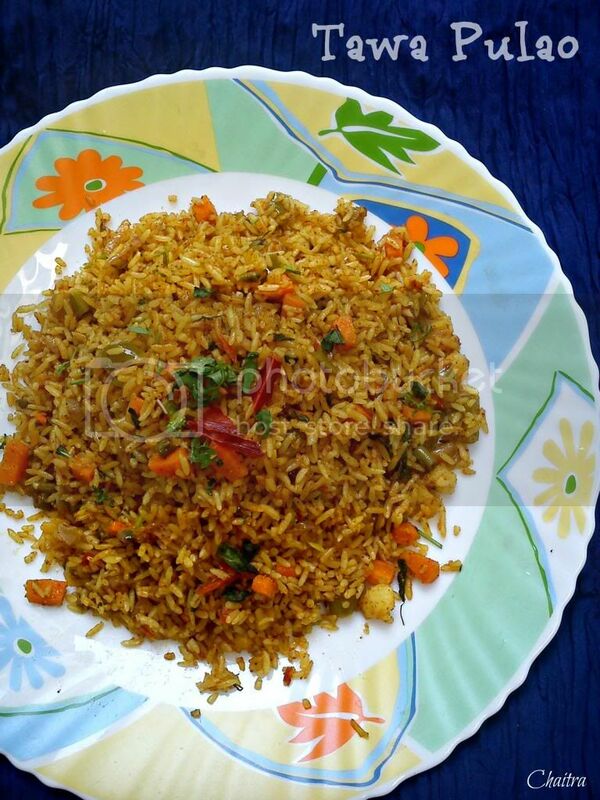 So lets get on the road for this simple yet spicy pulao. Heat oil in a pan. Once hot, add jeera seeds and let them sizzle. To this, add chopped onions and fry until translucent. Add ginger garlic paste and fry till the pungent smell subsides. Add tomatoes and cook till tomatoes turn soft. Add all the spice powders(including salt) along with potato and water. Mix well. Turn your flame to low and cook till oil separates from sides. Add Carrots, capsicum and green peas to this mixture. Mix all the ingredients and cook for 2-3 mins. Add rice to this mixture and ensure all the ingredients are combined well. Add chopped coriander. Off the flame and squeeze lime while serving. 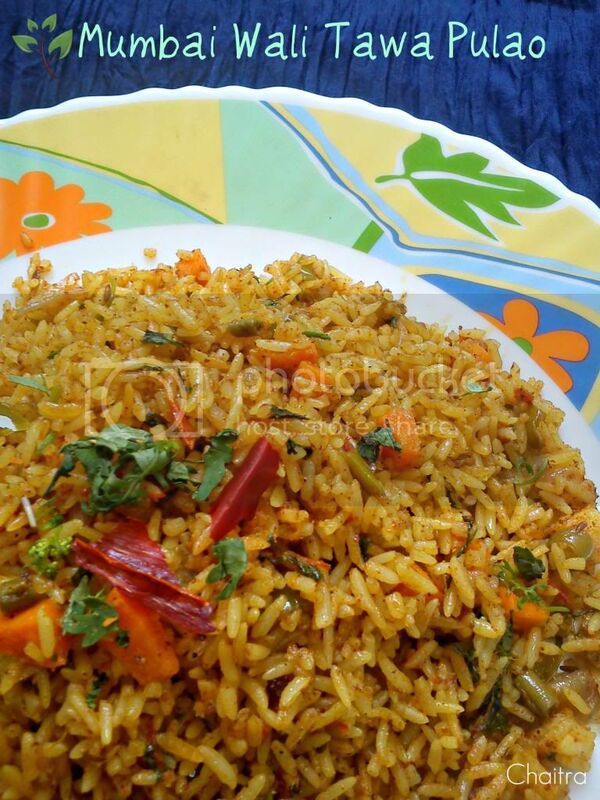 Team this spicy pulao with any mild or simple raitha. 1) Left over rice works perfectly for this recipe. Incase if you are using freshly cooked rice, make sure that it is cooled before preparing pulao. This will avoid breakage. 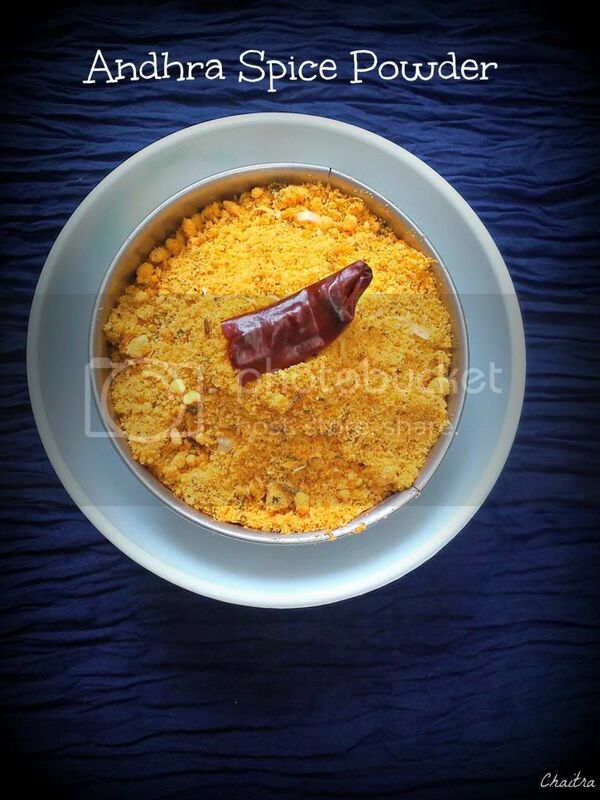 3) Make sure that you are balancing this spicy pulao with simple Mint Raitha or curd or plain raitha. Any spicy curry will be too much to handle and gets overboard.